SHIPPING WILL NEVER EXCEED MY COST BY MORE THAN 1.00!!! 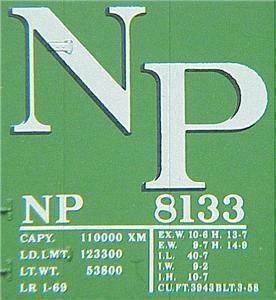 Micro Trains 22090 NP 40' Boxcar 8133 Micro Trains Northern Pacific # NP 8133, a 40' Standard Boxcar with Plug Sliding Doors issued in 2000 for 14.15 has sold for up to 18. This is NEW in Original Box with all inserts and Price on Label, a collector quality car. Note: I inspect each car carefully and attempt to be totally honest with my evaluation as to condition. However, I do not use a microscope to scan every minute detail. On some of the older cars it is highly conceivable that at some time in the past a car may have made some laps on a layout. If I can see any shadow of wear, I will try to make a note of it. If this is terribly important to you, please contact me prior to buying, and I will do a reinspection and post the results in the listing. This is very important, as I have duplicates of many cars, and I want to be sure that I send you a car that adheres to the condition I represent in my listing. 4.75 Shipping Handling is added to this item. International shipments will be by USPS International 1st Class for 5.75. Additional, similar items cost 0.75 (1.00 International) on combined invoice.Request total from me prior to checking out or paying. S H is added to each item purchased at the rate stated for the item, whether it is a single item or to be combined with other items on a single invoice. It is buyer's responsibility to request a combined invoice prior to paying.